With over 20 years of experience across the BFSI IT, Anup is business focussed and result oriented banking technology professional. He has rich techno-commercial experience – an excellent grasp of technology and commercial backed by vendor management skills. He has diverse experience with emphasis on key Leadership, Financials, Service Delivery, Portfolio & Program Management, Risk & Controls, Vendor Management and Waste Cutting. 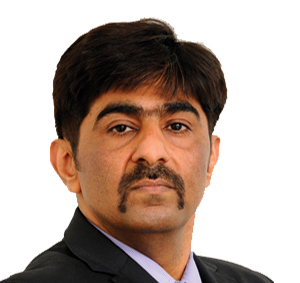 At YES Bank, Anup leads the mission critical role of spearheading Technology initiatives. As Chief Information Officer, he drive’s innovation and developing an IT strategy in accordance with the Business Strategy of the Bank to provide edge to his business in market. Innovative Technology forms one of the critical differentiating pillars at YES Bank in transforming the bank into finest LARGE Bank by 2020. Delivering Emerging Markets Business Initiative on Schedule, within Budget and with Value Proposition. Ensuring availability of IT infrastructure for business usage. Collaborating with PMO and Line of Business to formulate Program Management Framework to provide standardised and consistent program delivery to internal customers. Prior to Barclays, Anup spent over decade with JPMorgan Chase Bank, where he was heading the Portfolio & Program Management (P&PM) India & Program Management Office (PMO) Asia. He was responsible for managing the business off shoring initiative from US, EMEA & Asia, Infrastructure Program for creating technologically enabled seating capacity, Business strategies of co-location. During his tenure in JPMorgan, as part of global outsourcing deal, he was employed by IBM for almost 2 years, responsible for entire IT Infrastructure Operation Service Delivery, Program Management, Business Continuity Planning and Risk Management. Anup holds Bachelors degree in Electronic Engineering from Mumbai University. He holds various technical certifications in Microsoft, Cisco and IBM.